Flamewreathed Faceless is nearly strictly better than this card. Kudos to blizzard for making first powercreep in-class. Isn't 7/6 almost ideal for this card? I see some "CRAP BGH" in here, but unless you are broke and don't have any late game legendaries it is fantastic to make your opponent play his BGH against a 4 drop. So he now gets +2-8 Attack with Brann? and now neptulon will give u 8 random murlocs. Grrr, I'm so mad that my opponent had to waste his Big Game Hunter on my 4 drop! Gosh darn, it's so upsetting that I got bad RNG and I only have a 4/6 on turn 4! Rabble rabble, why would I ever play this over Piloted Shredder!? There's no way I could ever find room in my deck for FOUR 4 drops! The Lorewalker Cho value is WAY TOO IMPORTANT!! RABBLE RABBLE!!! +1 attack. 4/6 for 4 overload 1. Compare to Spectral Knight; both are 4/6 for 5 with an upside. Spectral Knight can't be targeted by spells or powers but Fireguard Destroyer costs one mana less up front. This means it can be played a turn sooner, or another minion can be played a turn sooner. +2 attack. 5/6 for 4 overload 1. Now it's flat out-and-out a better Pit Fighter most of the time. I mean, sometimes the inability to cleanly play it on 5 hurts, and sometimes its weakness to silence is an issue. But for the most part this is better. +3 attack. 6/6 for 4 overload 1. Compare now to Kvaldir Raider. Both are 6/6s for 5 mana in the very late game. Kvaldir Raider can snowball if left unchecked, but unlike the Raider, this can be played on turn 4 rather than on turn 7. That might be a little more significant. +4 attack. 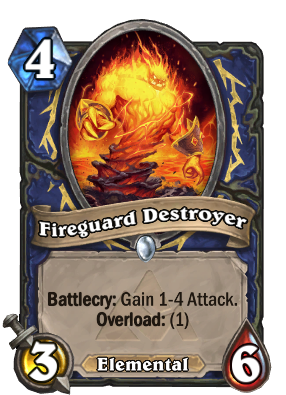 7/6 for 4 overload 1. The most polarizing outcome for sure; either Big Game Hunter has the beast in his sights and you're sad, or you are now the proud owner of a 7/6 for five with an upside. People just replace him with Shredders. I run both with no regrets, this is an awesome card. false because its a 4/6 5 mana which could be better. Just to be clear, there are plenty of solid 4 drops, but being one of the better one's doesn't change the fact that this is nothing exceptional. Even with Blackwing Corruptor around Fire Elemental is still set apart from most 6 drops. The fact that some classes relish having a weaker Dragon-dependent version of him just proves how strong he is. Only Savannah Highmane and a couple of Legendaries can compete with his value. And yet, he is not cool. He is HOT.